The V2 ICE DIR Regulator Set offer a no compromises design created purely for technical diving and featuring dedicated left and right first stage regulators. A key advantage of the "V" shape is the clear space between the first stage regulators which allows for a better head-up position and improved trim. Matched with the high-performance V2 second stage regulators, not only does the V2 ICE look great but it makes a clear statement  Im here for tec diving. The V2 ICE first stage regulator features a balanced diaphragm design with a dry chamber created by an isolation diaphragm to prevent freezing in cold conditions and protect the working diaphragm from the environment when in heavily silted water. The first stage is made from maritime brass with a high quality chrome finish. V2 ICE first stage regulators have 1 HP port and 2 LP ports located on one side of the body, with left and right first stages looking like mirror images. The unique design allows vertical port setting, for perfect hose arrangement and unhindered access to tank valves. It also leaves the space behind the head for clear allowing a better heads-up position for improved trim, as well as better to access the manifold valve. This a very neat, clean and professional looking setup, it is also good for instructional purposes as students can build critical safety skills, such as isolation and shut down drills, with clear access to all valves. The V2 ICE Second Stages Regulator is a pneumatically balanced downstream regulator with Venturi and breathing resistance adjustments. A heat exchanger allows operation in very cold water with reduced risk of freezing. Breathing resistance is in the range of 0.983  1.004 J/L, which reduces breathing effort and helps to minimise air consumption  this is a level of performance that you receive as benefits from a world-class regulator. The V2 ICE second stage also features a central purge button; this reduces the frontal area of the purge button to make it less susceptible to activation in a strong current. Tecline V2 ICE regulators are CE certified and tested in accordance with the requirements of EN 250. Tecline regulators also undergo extensive trials in punishing environmental conditions. Trials for the V2 included a dive depth of 110m in 8 degrees (cave in Croatia) and European lakes, mines and wreck diving typically between 40  60m in 4  6 degrees C water. After assembly and tuning, all regulators are tested by two independent technicians, to ensure that they meet Teclines exacting standards for performance and quality. 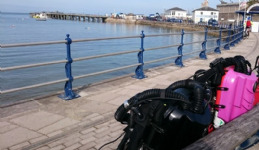 The V2 ICE sets are suitable for use with Nitrox blends up to EAN40 out of the box. A 10 year warranty is provided by SCUBATECH for the first owner, ensuring that the products are free from production and material defects. This warranty is subject to the correct care, operation and servicing performed at least annually by an authorised SCUBATECH service centre (service centres for other major brands may qualify, subject to confirmation). Details are included in the booklet provided with each set of regulators.